I came home to a present |Sundews Etc. For the last couple days my girlfriend and I were camping and hiking at Pinnacles National Park. For anyone in the central-ish part of California, Pinnacles is an amazing visit – stunning topography, lots of good hiking, and a whole host of interesting plants to admire, many of which were in bloom. Also there were more birds singing at dawn than I've ever heard in one place before. It woke us both up, and was incredible to hear. 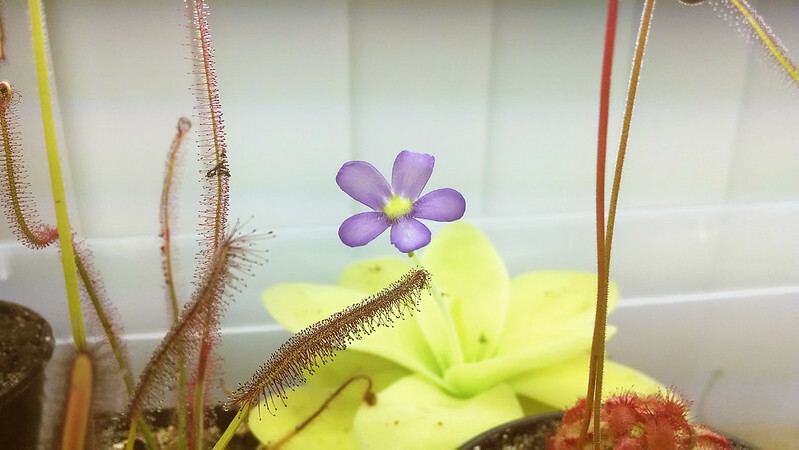 Pinguicula gigantea flower in the tray. I love how it's right in the middle, like a star. The Pinguicula gigantea bloom I mentioned a week ago is open and showing off right in the middle of the tray. Pinguicula flowers are bilaterally symmetrical, like orchids (and unlike sundews). Most commonly they're purple or lilac, and are fairly long-lived (if you don't hand-pollinate them). The P. gigantea flower isn't the most spectacular in the genus, but it's very lovely in its own right. It was not particularly easy to get this P. gigantea flower closeup. If you look closely at the crown of the plant, you can see a second flower stalk coming up as well. I tried to photograph it, but couldn't get a good shot. No matter. There are a couple other treats in my collection besides the big pretty Ping flower. 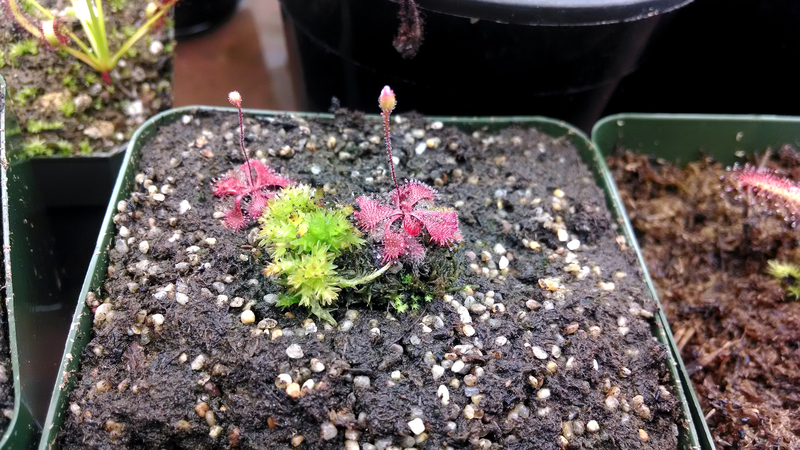 First, my Drosera brevifolia seem to have settled in nicely, and have both bloomed (or are about to do so) themselves. These D. brevifolia started sending up flower stalks right after I potted them up, but they're looking much better since last week's feeding. I got these in a trade some weeks ago, along with that chunk of Sphagnum moss which seems to also be responding well to the conditions (I may have to thin it out if it starts growing seriously, since those D. brevifolia are quite small, perhaps even smaller than a dime). I don't know if D. brevifolia is self-fertile, but I guess I'll find out in a few weeks. 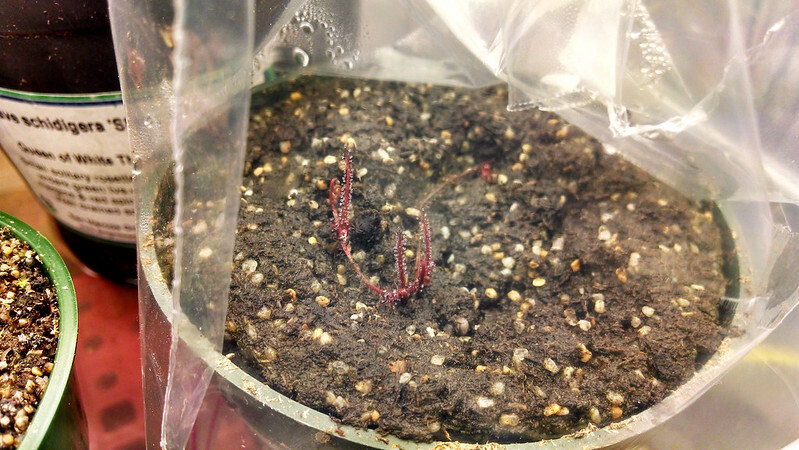 Finally, my D. filiformis plantlets are really taking off. Looks like I'll be getting at least 3 plants out of this D. filiformis cutting. Good deal! I suspect it was the feeding that did it – I fed these (and the rest of my dews) about a week ago, and since then they've almost doubled in size. 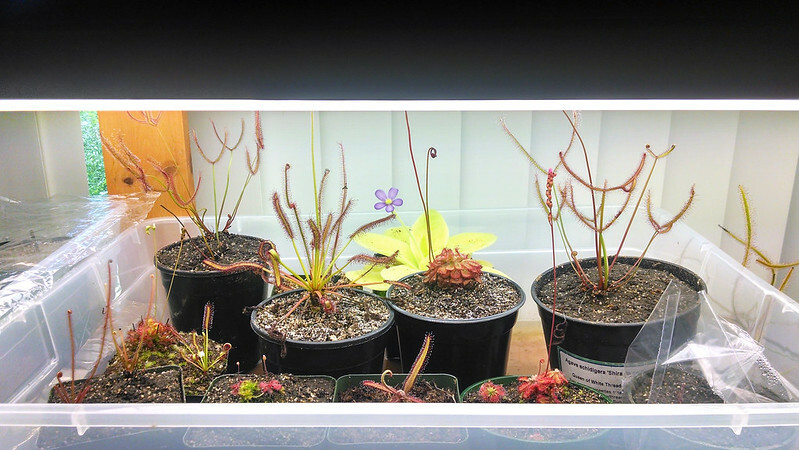 You can't underestimate the power of regular feeding for your sundews! All in all, its nice to be home.